1) Pit the olives and let them washout under a stream of cold water. 2) Put the breast meat of the chicken in a blender and blend then add 2 fl oz (5 cl) of the cream and blend again. 3) Pass the mixture through a sieve using a wooden spoon to force the larger pieces through. 4) Pour into a small container set on ice and add 2 fl oz (5 cl) more of the cream and stir in gently using a wooden spoon. 5) Finely chop 1.75 oz (50 g) of the black truffles and add to the cream/truffle mixture and stir in. 6) Stuff the olives, a culinary syringe helps. 7) Finely slice the shallots and sweat them in a pan with butter and the olives on a very low flame but do not let them turn color. 8) Deglaze with the white porto and the cognac and reduce by 25%. 9) Add the last of the cream. Reduce again. Add the truffle juice and the last of the finely chopped black truffles. Season to taste. 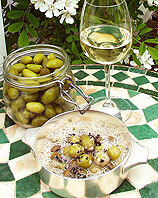 Place 8 olives per serving in a small cup or bowl, cover with a small amount of the sauce served hot. On the side, place several slices of toasted country bread. M. Meneau “butters” them with a little goose fat.